This is a prime example of the power of Social Media. Till date, Anna Hazare has gone on “Fast unto death” campaign many times previously in his life, but the reach, publicity and fame that the Jan Lokpal Bill against corruption has got has to be seen to be believed. Internet & Social Media sites have been abuzz with articles / messages showing support for Anna Hazare’s fight against corruption and his support for Jan Lokpal Bill. 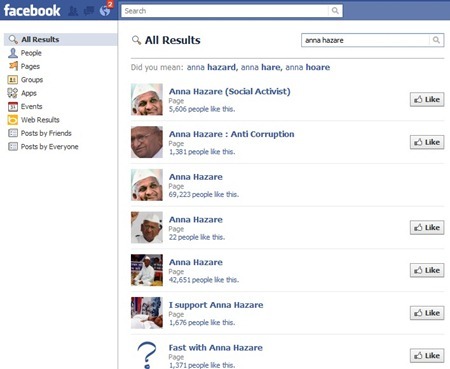 Just to give you some examples – Facebook now has over 100 pages dedicated to Anna Hazare and his campaign. These 100s of Facebook pages showing support have garnered over 200,000 likes in just couple of days. 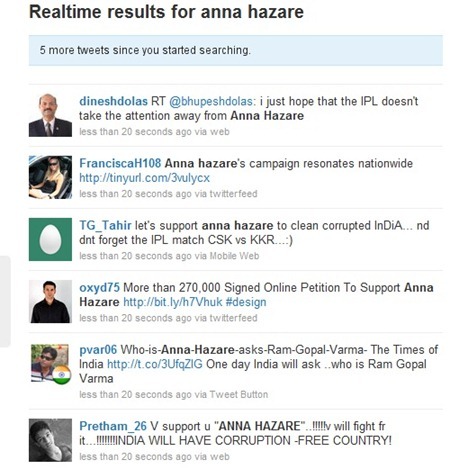 Not only Facebook, but twitter is also abuzz with messages showing support for Anna Hazare’s campaign. Infact, on Thursday, #Anna Hazare, #corruption, and #Jantar Mantar, were the top trending words and phrases on Twitter. Even a simple search shows that messages are being posted at a very fast clip. Take a look at this screenshot below, where with few seconds I witnessed over 25 – 30 messages. Youtube is not far behind – There have been hundreds of Videos that have been uploaded in support of Anna Hazare’s campaign. Even the Television News channels are covering every second of this campaign. It is also for the first time that foreign Media (online as well TV) has given quite a bit of coverage. People from across the country have reached Jantar Mantar to physically support Anna Hazare. Hundreds and thousands of Indians across the country have either skipped a meal or gone on fast the whole day to show their support ! This truly is the power of Social Media and the biggest reason is that even a common man’s view can reach millions today in matter of seconds. Posting a message on Facebook or twitter takes very little time and effort, but if it is collectively put across in one voice, it sure it an unstoppable force. I also think that India as a country is fed up with innumerable Scams and Corruption – The latter part of last year witnessed some or the other scandal literally every couple of weeks. With the nation behind him – there is no doubt that Anna Hazare will be successful in his demands. Just think – if the government does not give in to his demands, there is a possibility that even the Government can come down! So, how have you shown your support for Anna Hazare’s campaign against corruption ? India lower than China in English proficiency ? I don’t know who and how is anna hazare but i have brain to think but anna ji is fighting for a noble cause so wee all indians should together under the umbrella of anna ji and should pray for his , of course for our’s success. Would have been even better if these keyboard samurai had come out on to the streets to support Anna. Governments don’t read facebook comments you know. Yes, that’s true. lacs of people have supported the Anna movement. We must understand that always in any cause majority of the populous feel that ‘yes, this is right’, or ‘yes, this is wrong’. But because of our social structure majority of them could not participate physically. Now they have a tool in the form of Net, and more specifically the social sites. So with all their compulsions with regard to physical presence, they successfully use the social sites.